Agenda: Payback is a joy to watch, especially if you're a fan of revenge thrillers. Sean Patrick Flanery's Steve Walsh is a witty film producer who has rubbed one too many people the wrong way. He's kidnapped and beaten by Eric Belfour's Peter, who is offering people an opportunity to exact torturous revenge on Steve for money. Based on the premise, one could expect it to be a strong meditation on anger begetting anger, but Agenda: Payback is much more. 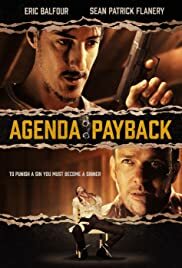 Between the action-packed story, witty dialogue, innovative editing, and powerful performance by Flanery, Agenda: Payback is a fun watch for anyone looking for an hour-and-a-half of high-octane thrills.